Bassam Khawaja (Right) and Nadim Houry (Left) present the study of Human Rights Watch regarding Lebanon's open burning of waste. 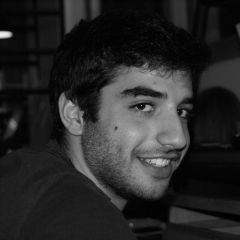 Photo by Hassan Chamoun. 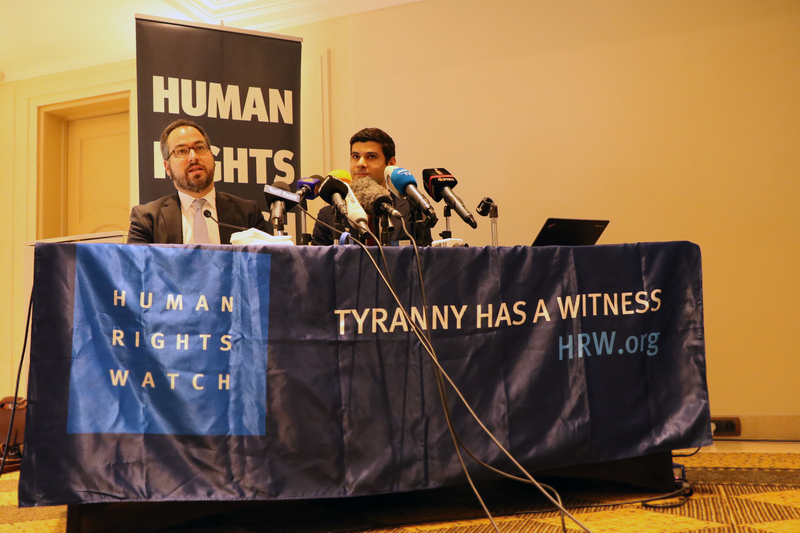 Global Voices’ Hassan Chamoun attended the conference launched by Human Rights Watch as part of our ongoing coverage of Lebanon's garbage crisis. Lebanon's ongoing garbage crisis was the subject of a Human Rights Watch (HRW) study entitled “As If You're Inhaling Death: The Health Risks of Burning Waste in Lebanon” released on December 1. HRW's study included 104 interviews with stakeholders as well as field visits to 15 different ‘open dumping’ sites that do not take environmental or health concerns into consideration. This type of open burning of waste is linked to severe impacts on human health, from heart conditions and cancer to skin diseases, asthma, and respiratory illnesses. The crisis attracted international attention in 2015 with the ‘You Stink’ Movement, a loosely-organized protest movement that started as a response to the government's inability to replace the Naameh landfill that received waste from Beirut and the Mount Lebanon's region (roughly half of the Lebanese population). pattern of poor government planning and management, inadequate support to and oversight of areas outside of Beirut and Mount Lebanon; overuse of landfills, open dumping and burning […] and a lack of transparency. 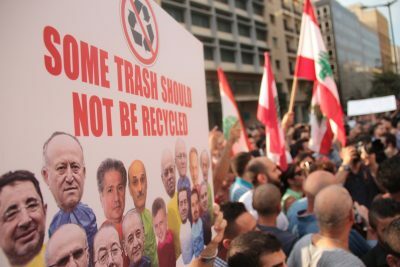 The movement's name, ‘You Stink’ from the Arabic ‘طلعت ريحتكم’, referred to both the smell of trash piling up on the streets and to the political system itself. A 2016 survey by the United Nations Development Program (UNDP) and the Lebanese Ministry of Environment reported that Lebanon had a total number of 941 identified open dumpsites compared to 670 in the 2011 survey. 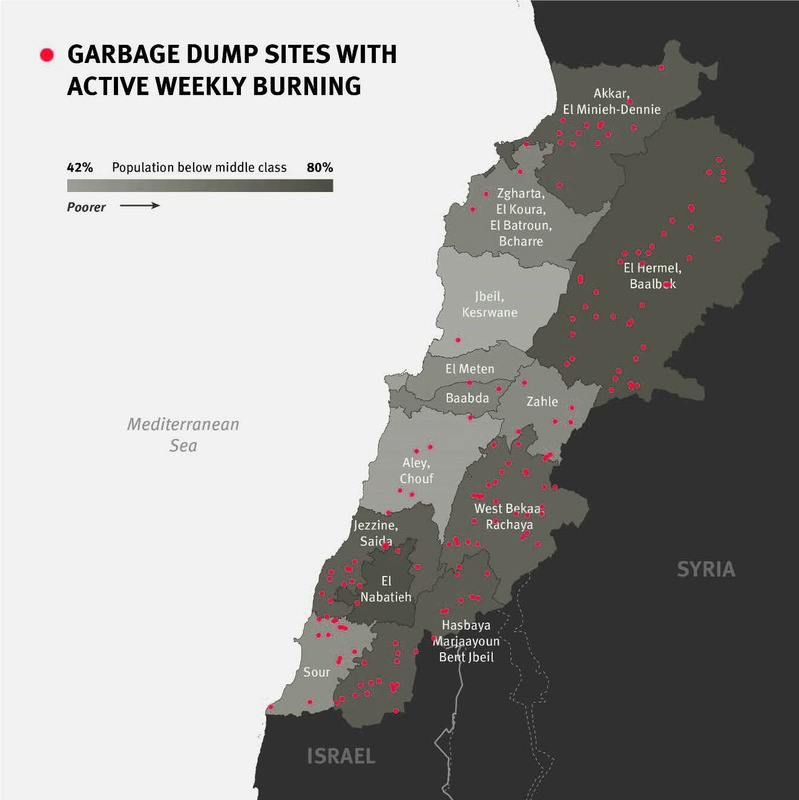 Using an UNDP map along with data from the Lebanese Ministry of Environment, HRW showed that more than 150 open dumps are burned on a weekly basis. The Operations Room of the General Directorate of Civil Defense (Lebanon's fire department) reported that they have responded to 4,426 reports of open burning of waste since the beginning of 2015. According to this report, the number of open burning cases reported in Mount Lebanon alone rose 330 percent in 2015 and a further 250 percent in 2016. When they burn we can’t breathe […] We’ve had to go to the hospital because of this. My wife has gone four or five times [since burning began], my son and I went two times. All because of breathing [problems]. We usually stay two days to a week. The hospital said it was an infection in the lungs because of the smoke. They would give us pills, they were very expensive. They also gave us oxygen masks…We’re not even able to fix our house because of how much we spend on medical care…In the summer we can’t sleep because of all the smoke, we kept waking up trying to breathe. Because Beirut and Mount Lebanon are two of Lebanon's wealthiest provinces, the closing of their landfills mobilized citizens and grabbed international headlines. Yet the rest of the country was just as impacted but less recognized. For example, Beirut and Mount Lebanon's waste is collected, treated and disposed of by Sukleen and Sukomi, two controversial private companies. 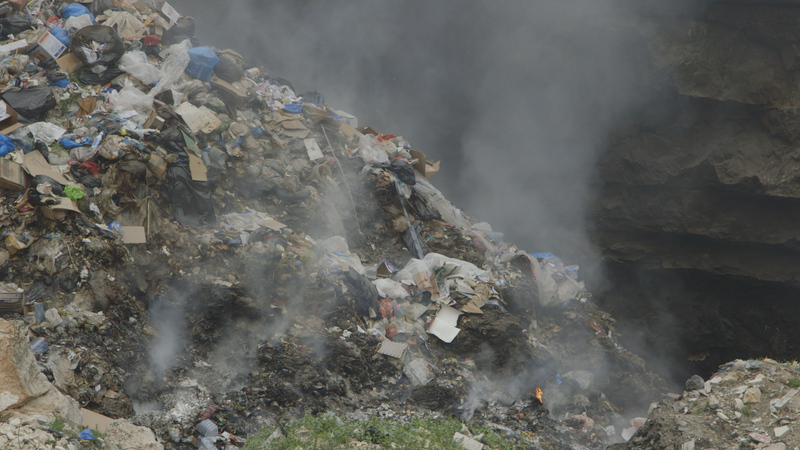 In contrast, in the remaining regions of Lebanon, municipalities are responsible for their own waste. Municipalities theoretically receive funding through an “Independent Municipal Fund” fueled by taxes collected by the central government. In practice however, the Fund's disbursements have been irregular and, at times, delayed for months. A lack of effective funds has driven municipalities to find quick solutions such as open dumping and burning. Open burning of waste in Majadel, South Lebanon. Photo by Human Rights Watch. Used with Permission. In March 2016, the Lebanese cabinet adopted a waste management plan calling for the use of waste-energy-technologies starting in 2020. Until then, Beirut and Mount Lebanon will rely on two sanitary landfills constructed to receive garbage for four years: one in Bourj Hammoud (Greater Beirut area) and one in Costa Brava (near Beirut's airport). The Costa Brava landfill, as Nadine Mazloum reported for Global Voices, has been deemed unsafe and threatens both the environment and air traffic. The rest is supposed to go to Sidon, a city 40 kilometers south of Beirut. The report highlights a correlation between the burning of waste and income levels. Of the 100 open dumps in Beirut and Mount Lebanon, just nine are being burned while the rest of the country (where the other half of the population lives) has nearly 150 open burning dumps. Lebanon is a party to the International Covenant on Economic, Social and Cultural Rights (ICESR), which it ratified in 1972, and therefore legally bound to improve the standard of living of its population. Contrary to government claims, the waste crisis is far from over. Will we be tasting garbage in our wines and vegetables next harvest? Where is the Ministry of Agriculture, Ministry of Environment, Ministry of Public Health or Ministry of Tourism?